If you love taking unusual photographs when you travel, you really need to go to Lake Abraham, in Alberta, Canada. Its frozen landscape is a winter wonderland for any keen photographer where you can capture unique shots of some stunning snowscapes and some even more amazing frozen bubbles. Don’t let the areas remoteness put you off planning a trip there. Yes, it is in the Canadian Rockies, but getting there is not as complicated as you might think. Nor do you need a massive amount of expensive equipment to get an incredible picture. 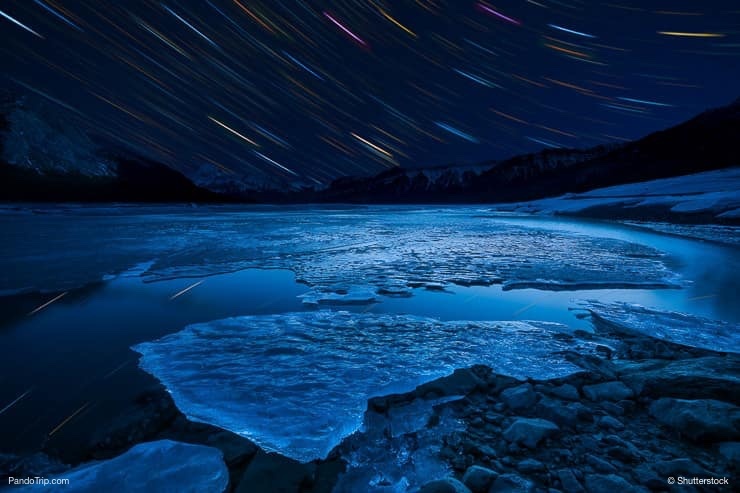 What you will need to know is how to go about taking your pictures safely, which are the best places to go to get great shots and maybe a few tips on shooting the frozen air bubbles in Lake Abraham. If you’re shivering at the thought of sleeping out in the open in all that snow, don’t. While Lake Abraham might be a bit of the Canadian wilderness, you won’t need to camp out as there’s some great places to stay. To find out more, just keep reading and even if you’d never contemplated photographing ice bubbles before, by the time you’ve finished this article you’ll be packing your suitcase with snowshoes. It’s quite isolated so make sure your vehicle is roadworthy enough for the trip, you’ve got back up food supplies packed in case you breakdown and don’t forget to fuel up at the last gas station which is in Nordegg. If the worst happens and your vehicle does let you down, you might find yourself without a phone signal, so don’t leave your car. Stay with it until the highway patrol comes along and enjoy some hot coffee from that extra large Thermos you stowed on the back seat just in case. Although winter grasps Lake Abraham in its icy grip from as early as late October, there won’t be any frozen bubbles to see until much later in the season. It all depends on Mother Nature and what weather she sends so don’t plan to take your trip too early. A good time to consider going is after you’ve taken down the Christmas decorations, seen in the New Year and dusted the glitter off your camera case. Halfway through January through to February is from when there’s more possibility of Lake Abraham being completely solidified and you’ll have the best chance of photographing frozen bubbles. Winter temperatures do fluctuate though and on a major scale, anywhere from five plus to minus thirty, which affects the ice forming process. As can the warm winds, or chinooks as they call them in Canada, which blow in and melt the surface ice which can leave it opaque. While you’re not going to be spoilt for choice between a massive range of five-star hotels, there are some great places to stay around Lake Abraham. The ultimate accommodation has to be Aurum Lodge. Run by a man who probably knows more about ice bubbles than anyone and he’s also photographed more frozen bubbles than anyone else too, Aurum Lodge has stunning views down onto Lake Abraham. So if you don’t like the cold and have a good telescopic lens on your camera, you never know, you might well be able to get a decent shot from your bedroom window. You’ll need to book well in advance to get a room there for when Lake Abraham is frozen over as it’s a very popular place, but there are other options which you might want to consider. Although Nordegg isn’t exactly Las Vegas there are a few more people around than you’ll find on the shores of the lake. If you’re not on a big budget, try the HI-Nordegg Hostel which is just a thirty minute drive from Lake Abraham, open all year round and very reasonably priced. Share a dorm with friends, have a cookout in the communal kitchen or if a warm chinook blows in, then light the barbecue and have a great night out on the terrace with a few beers. If you prefer your outdoor experiences to be more on the wild side then book into the HI Rampart Creek. It’s a bit further away from Lake Abraham, around an hours drive, and there’s no electric lights to read by at night just the flicker of flames from the fire pit. Though you’ll be pleased to know the dorms are heated. You won’t need to pack your snowshoes if you stay there either as they’ll provide them for you. The waters of Lake Abraham stretch for just under sixty square miles. That’s a lot of lake, so you’ll save time searching if you know before you go where the best places to find the frozen bubbles in Lake Abraham are. At the top of everyone’s list is Preacher’s Point. The H11 highway, coming from Nordegg, runs right by this part of the lake. So if the conditions are right, you’ll be able to photograph frozen bubbles without venturing too far into the wilderness or far from your vehicle as there’s a great staging area where you can park. The lake waters at Cline Landing are relatively shallow and so freeze over easily, but it’s a spot which is quite likely to be covered with a dusting of snow which doesn’t constitute ideal conditions for ice bubble photography. The shoreline along the Belly of Abraham often gives up the best results. Try the stretch between Hoodoo Creek and David Thompson Resort as shots of superior clarity have been captured there. Don’t think that just because these are the best spots to see frozen bubbles they’re guaranteed to be there. They’re not. Weather conditions, especially the warm chinook winds, can melt the upper layers of ice which often leaves the surface cloudy and difficult to see through. Bubbles are bubbles and if they can find an escape route, well, they will do. So be prepared to visit several spots around Lake Abraham to find the one which will hopefully give you the results you’re looking for. You don’t need to be an expert photographer to get some interesting shots of the frozen bubbles in Lake Abraham, but you will need something more than a disposable or instant camera to make the trip worthwhile. Light conditions on the ice vary so you’ll need to be prepared to cut out glare. Consider investing in a polarizing filter before you go, you’ll kick yourself if you don’t. If you’re out on the ice and discover an amazing frozen bubble formation, you’ll more than likely want to get a close-up shot to capture all the magical details. Not all cameras can manage that, but a macro lens attachment will probably give you the end result you’re looking for. There’s some amazing landscapes around Lake Abraham which will quite likely ignite your photographer’s creative juices. To get some fantastic shots of the ice with mountain backdrops, don’t forget to pack a wide-angle lens. What you need to understand about Lake Abraham before you go is that it is in the middle of nowhere. There are no convenience stores, no gas stations and no help close at hand if you need it. If you’ve never been someone who goes adventuring in the great outdoors, you might want to consider taking a map reading course before you head out to Lake Abraham. Understanding this old fashioned way of finding your way about will come in handy as you’ll have no signal to use the GPS on your mobile phone. Even better, when you’re not familiar with the terrain, it’s much safer for you to go with an experienced guide who knows their way around. Ice conditions are unpredictable. A covering of snow can mask dangerous areas where the ice isn’t as thick as you might think it is or has some fault in it. The ice needs to be at least ten centimetres thick before you should even consider venturing out on to it and that is still no guarantee it’s safe. To walk on the ice, you’ll need crampons attached to your boots. Make sure you have the right equipment and clothing. This is not your average ski resort. It can be a very harsh environment and even when the sun is shining, the wind chill factor can be crippling and with gusts strong enough to blow you over. So be prepared. Don’t go alone. For your own safety, either go with friends or join one of the group tours guided by an expert. You won’t need to consider just your own safety, but keep in mind that of your equipment too. If you’ve mounted your camera on a tripod because you can’t stop your hands shaking enough to get a still shot, be careful. It too can get blown away by the wind and you could end up watching your camera go skidding across the ice and far enough out of reach to be unretrievable. You might like to think that somewhere, down in the depths of Lake Abraham, there’s a lake goddess with a digestive problem, but that would be stretching any one’s imagination just a touch too far. What is down on the bed of the lake is vegetation which, in its natural process of decomposition, is being consumed by bacteria. 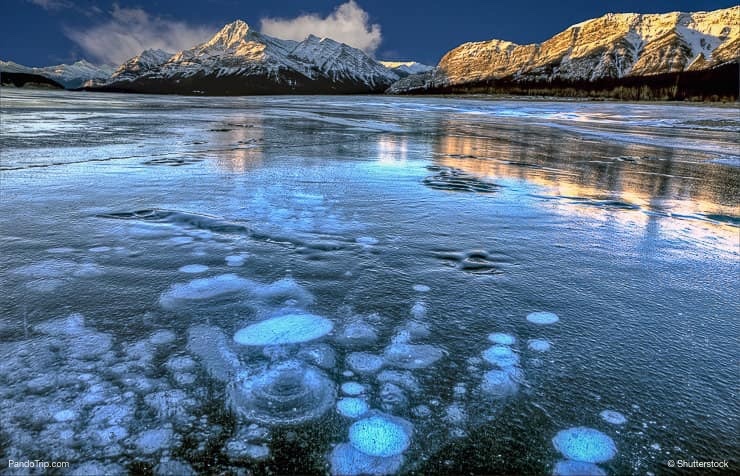 It’s those bacteria which emit the methane bubbles which freeze in the ice. So, when you’re out there snapping away with your camera, just remember what you’re actually photographing are, in fact, bacteria’s farts. Have fun!